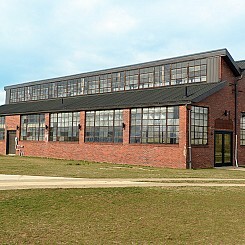 In this unique building, wooden crates for worldwide transport of sheet glass were once fabricated. Its energy efficient V-shaped roof continues to provide natural light and ventilation. This building has since been preserved as a public and private event space available for rent. The abundant glass windows, spacious main room, and facilities make it the perfect spot for any gathering up to 175 people (120 with tables/chairs). Uses could include parties, work events, and family gatherings, among others. 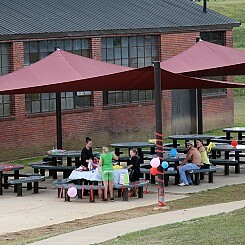 There are also multiple picnic tables under cover adjacent to the building on the Barone Patio. 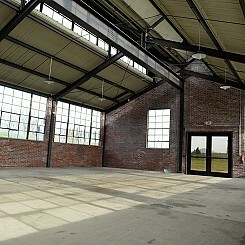 If you wish to rent out this unique space an event coordinator will be on site at the time of the event. The Pavilion was a gift from and therefore dedicated to the Community Foundation of Mount Vernon and Knox County. It is located behind the Urton Clock House, which is on Pittsburgh Avenue. This unique structure is perfect for intimate gatherings of family and friends.